Most methods proposed so far for classification of high-dimensional data are memory-based and obtain a model of the data classes through training before actually performing any classification. 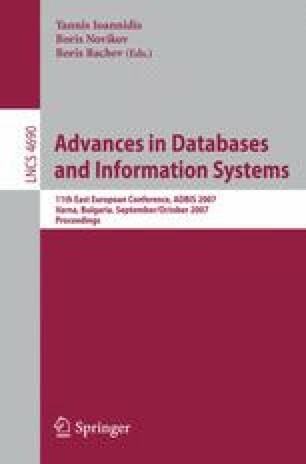 As a result, these methods are ineffective on (a) very large datasets stored in databases or data warehouses, (b) data whose partitioning into classes cannot be captured by global models and is sensitive to local characteristics, and (c) data that arrives continuously to the system with pre-classified and unclassified instances mutually interleaved and whose successful classification is sensitive to using the most complete and/or most up-to-date information. In this paper, we propose LOCUS, a scalable model-free classifier that overcomes these problems. LOCUS is based on ideas from pattern recognition and is shown to converge to the optimal Bayes classifier as the size of the datasets involved increases. Moreover, LOCUS is data-scalable and can be implemented using standard SQL over arbitrary database tables. To the best of our knowledge, LOCUS is the first classifier that combines all the characteristics above. We demonstrate the effectiveness of LOCUS through experiments over both real-world and synthetic datasets, comparing it against memory-based decision trees. The results indicate an overall superiority of LOCUS over decision trees on both classification accuracy and data sizes that it can handle. The project is co-financed within Op. Education by the ESF (European Social Fund) and National Resources.